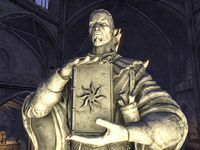 Xarxes, also known as the Ageless One, began as a scribe to Auri-El and has kept track of all Aldmeri accomplishments, large and small, since the beginning of time. He created his wife, Oghma, from his favorite moments in history. He is worshipped by Altmer and Bosmer. Hermaeus Mora claimed that the knowledge he gave to Xarxes was recorded in the Oghma Infinium. The scholar-priests of the divine scribe, secretive though they are, are said to preserve an ancient tongue long forgotten to any but their order. This page was last modified on 2 December 2018, at 00:46.